The game of war with a twist. Cats vs Aliens with modifiers. Quick and easy to play. The ultimate game of War. Cats vs Aliens with modifier cards. Quick and easy to play. The game is played like war with two factions except there is a twist. Modifier Cards. These are cards which change the entire mood of the game. You will have hours and hours of fun playing this mad adventure game. You can play either 2, 3 or 4 players, and if you add decks you can even play with more. So come join the great adventure and play a game of war with a twist. Title : Super Easy, Super Fun! Review : We picked up the game at a local con (Thanks for the drawing inside, Travis!) because we have young nieces and nephews who love to play games. We played all Thanksgiving weekend and it was A HIT! Easy enough that by Sunday morning the 8 year old and 5 year old dealt the cards and started a game without any adult supervision :-) Will be purchasing another one to give as a Christmas gift! Review : Great family fun! We purchased this at Tucson comic-con to play with our nieces and nephews. After the first game, it became the go to game to play. Just when you think you're out of the game, a modifier card mixes everything up! The only problem... we didn't want to leave the game. Guess we will be purchasing another set 😄. Review : Since the day it arrived it has been a huge hit! My kids have played it with their friends, taken it on a couple of trips, brought up to play with their brother at college and tomorrow it's heading out on a school camping trip. Although a simple concept, it's lively enough for adults and still simple enough for kids. Both my boys(age 9 & 13) asked me to add "It's super fun!" We can't wait for the next for No Mercy 2! Review : If you've played the simple card game War, then you are well on your way to understanding the dynamics of No Mercy. 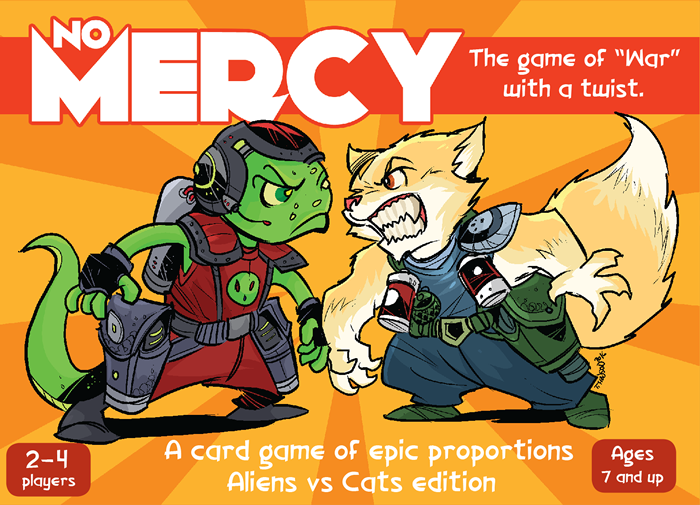 At its simplest, the game consists of two players (there are rules for more players as well), one being the aliens and one being the cats. Players go head to head, drawing a card from their deck, and whoever has the highest number on those cards adds both cards to their deck. Easy, right? Well, in No Mercy, there is a twist. There are modifier cards. Whoever draws the lowest scoring card has the option of drawing a modifier card to shake things up a bit. There's a risk involved, though. Sometimes the cards add points, but sometimes they subtract. There is a card to swap decks with your opponent, so if you are winning, you might have to give your opponent your fat deck while receiving their thin one. And then, of course, if you draw a card equal to your opponent's, you have war. This can be a way to gather up several cards at once, but again, the results can be unpredictable with the modifiers. My son and I had a double war, and at the end, I had the highest value card. Then, he drew the "Ceasefire" card which meant he got all the attack cards in play. I believe it added up to be fourteen cards in all! The artwork on these cards is adorable. The cats and aliens all have personalities, and they are very colorfully rendered. Their names are amusing as well (Claudius von Flufferpants is my personal favorite!). The cards themselves are high quality, like anything you'd expect to find at the game store, and its packaged nicely as well. The instructions are written quite clearly. All in all, I think this is a great game to play with your friends or with your kids. It's fun and light, can be competitive, and with the modifier cards, is definitely not boring. The playtime on the box says 30 minutes, but I have found it to be closer to an hour the few times I've played so far, with both two and three players. But even if you have a short time, you can always just count the cards to see who has the most to call a winner. I think this is the kind of game that would be great to play while waiting for food at Denny's. My son has asked to play this game every day since we first got it--he thinks it's a lot of fun to trip things up with the modifiers. The age range is 7 and up, but with some reading help, I think a younger kid would enjoy this a lot as well. Review : My family loves this game. The rules are easy, the illustrations are awesome and the 'twist' cards make it super fun. All my kids learned the song, "I'm a little teapot". Get the game and you'll understand. Review : A great twist on the game of War. It takes a pretty amazing brain to conceptualize and create an improvement to an old classic, and Travis definitely has that. The artwork is exquisite, and my daughters have already figured out their personal favorite characters on both sides. (Confession: Patch and Agent M are mine...) Cards are good quality and have not fallen apart after a few major shufflings. The times I've played it, the game is still going strong after an hour. Would recommend having the modifiers all in one pile so as to mix things up a bit...otherwise you get an idea of what's coming next after the first cycle through each player's pile. 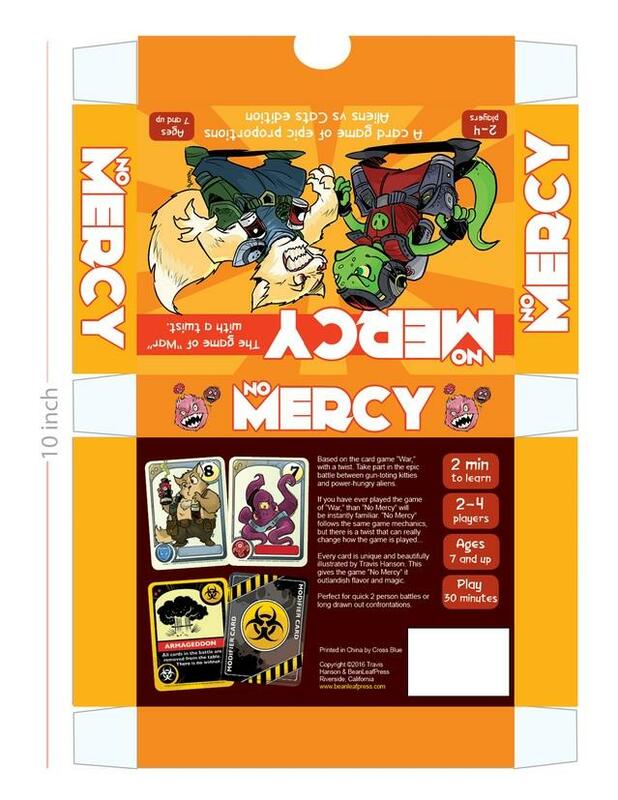 Very much looking forward to the expansion pack...a 4-player game of No Mercy will bring a huge amount of hilarity and hours (literally) of family fun! Review : The always incredible art of Travis shines through in this fun card game! A must have!